I bought this one recently. Works fine with TigerTool 2.5. That's good to know as it was my most recommended lead for some time until it became hard to find. Thanks for the tip. My netbook is Windows 7 and old laptop is XP, and the headline description implies it's for Win 8.1 and 10. But reading down, it does seem to support Win 7 and XP. Think I'll give it a go! TigerTool has been released in 3 versions over nearly 4 years and has been downloaded well over 2000 times. As with any software it's had the potential for the odd bug or two but the current version (V2.5) has no known bugs and is currently being used successfully on Mk1, Mk2 & Mk3 Tiger 800s & Tiger Explorers / 1200s. It works fine with Windows versions XP, 7, 8 & 10, including those running under Boot Camp on Apple devices. I wrote TigerTool to work with ELM327 leads and released it on the forum as a free download so that anyone with even basic computer skills could have a cheap option to access their bike's ECU to carry out the supported functions, initially just resetting the SIA. Of the 1000s of people who have downloaded the software, very, very few have been unable to get it working for them and decided to give up. So far, for those that persevered, the main problems seem to be poor quality leads, lack of Windows driver support from the lead seller, OBD connector problems on the bike and sometimes just simply operator error(!). It's very clear, though, that poor quality leads are by far the biggest problem that people encounter. So what is this talk of a 'quality' issue? Unfortunately only a tiny fraction of ELM327 leads sold online contain genuine chips from ELM Electronics, and this is where the problems start. As noted on here some time ago, the first release of the genuine ELM327 chip was left unprotected by the designers and was quickly copied by cloners. Now almost every lead you buy from eBay etc contains a chip with a variation of this cloned early code and claims to be something that it's not. For example, ELM Electronics never released a V1.5 chip yet many for sale claim to be just that. TigerTool uses the most basic ELM327 command 'AT D' to initialise the lead with a default set of parameters before configuring the necessary settings to talk to the ECU. It turns out that if the lead fails to respond to this command then it also doesn't support some other more critical commands, and therefore I refer to it as a poor quality lead. Of course I have no control over the quality of ELM327 leads that are being sold, and increasingly I'm hearing from too many people getting caught out buying poorer quality leads. Having said all of this, and as the vast majority of TigerTool users know, there are many cloned leads that work quite happily. In my experience, even the lead Dealertool supply is a cheap(ish) clone but they ensure that it's one of the better quality types. The genuine ELM327 chips alone cost more than a complete cloned lead, so I can see the logic there. T800XC. Once again going above and beyond to help folks out on this forum. I would advise ignore any supplied CD full of so called drivers and free software (AKA a disc full of crap) and simply plug in your lead and allow windows to find a suitable driver. If windows fails to find a driver for your particular lead then obviously resort to the supplied CD. One of the .exe driver installs on the disk was full of question marks, even in place of OK and Cancel. Obvious rubbish which I'm sending back. Thanks to TurboTom and T800XC I've ordered the lead they recommend. From a Dutch advert on eBay to its English equivalent, payment to Hong Kong, seller in Houston Texas, item to be delivered from Portsmouth, UK! Talk about global trade! T800XC, thanks once again for your expertise and commitment to helping us out with Tiger Tools. 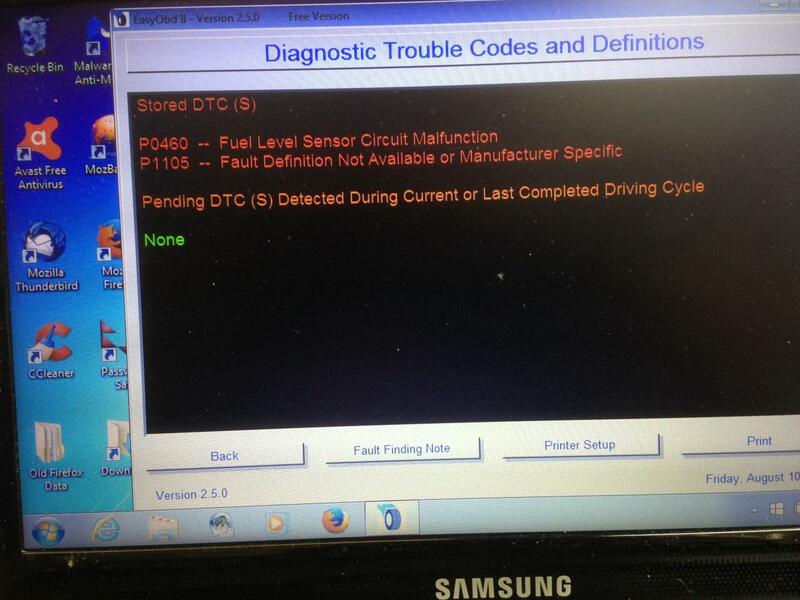 The one useful thing it did do was read the DTCs, see screenshot. What does P1105 mean? Clear it and hope it doesn't come back? When I took the petrol tank off to change the plugs I stood it on its nose leaning against the bench because I'm short of space in the garage, and I wonder if it upset the fuel level sensor and caused the P0460 DTC. I assume the first thing to do is clear the fault code and see if it comes back? Maybe the fuel level float has jammed or damaged the sensor by being moved to an unusual angle. Most likely you turned the ignition on with the MAP sensor disconnected when you had the tank off. Neither of these DTCs are serious and should clear ok, but check the connections to both sensors are not damaged. Probably. When the tank was off I had the electrical connector plugged in but not the pipe. I've now cleared the DTCs and the MIL has gone out, which is progress. But the fuel gauge isn't reading anything, nor is the low-fuel light on although the level is low. Yet it was showing low fuel yesterday. Maybe next time I fill up it will start working.